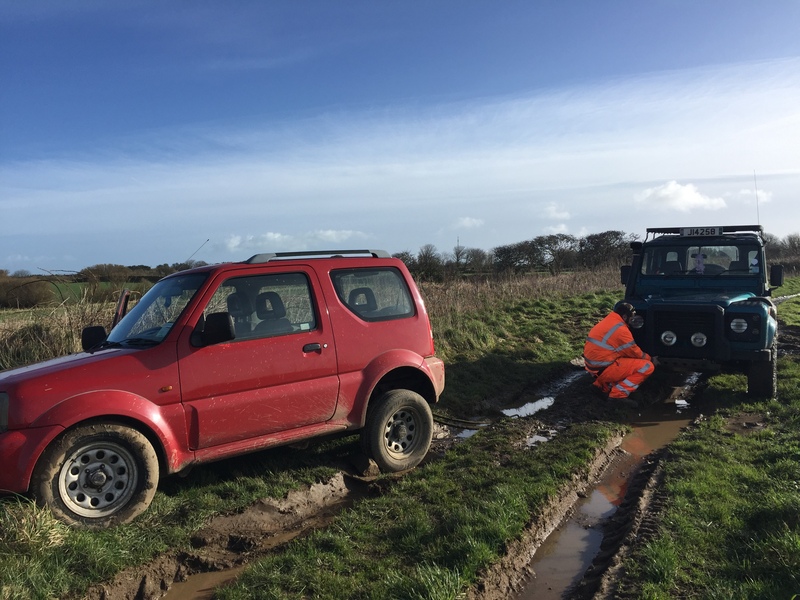 Hi, I’m Elin, the chough student (and chief breaker of Jersey cars – four so far!). I’m here on a six-month placement with Durrell working with the re-introduced choughs. I spend a couple of days in the Bird Department of the Zoo too, making friends with teals and hornbills, which balances everything out nicely. I’m enrolled on the BSc Bioveterinary Science course at Harper Adams University. Each student has to do a placement year in industry; I spent the first half in South Africa trying not to get volunteers squashed by elephants, but alas I left the sun and the noisy lions for a quieter time in Jersey (I was not expecting the snow which made me question my life decisions a bit; but it’s all fine now). The first of four to suffer the Cunningham curse. Photo by Elin Cunningham. I have to complete an honours research project for my degree, and the opportunity of working at the Zoo with the choughs was perfect for this. As a person who stresses an unhealthy amount, being able to collect data and write my project up whilst I’m in Jersey is the perfect solution to relieve final year pressures of university life. Also it means I can hide inside on the computer on rainy days instead of chasing choughs and not feel bad about it. 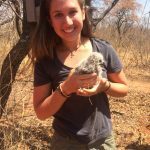 I decided to focus my research on the issue of parasites in the choughs. The biggest threat to the Jersey wild-born chicks last year was Syngamus trachea as Lil’ Wheezy will tell you (read the report here). Syngamus trachea (also known as gapeworm) is a parasitic nematode that lives in the trachea and bronchi of birds. The eggs of the nematode develop in insects. Birds unknowingly ingest the nematode when they feed on infected insects. 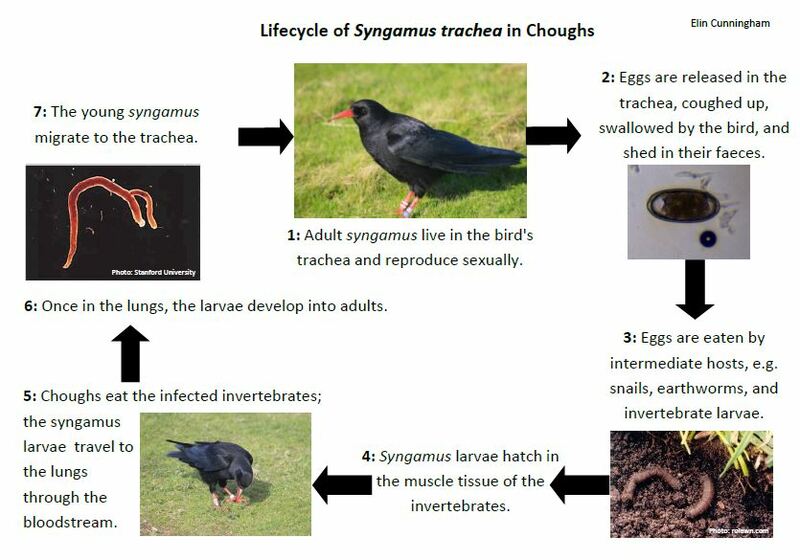 Since choughs are specialist invertebrates feeders they are highly likely to harbour the parasite; I’m very proud of my lifecycle map which should explain everything nicely! Below is a simplified image. The full pdf I created can be found here. Syngamus has been reported in wild and captive choughs across the UK, but it is incredibly hard to treat in wild birds. Daily monitoring of behaviour and parasites in the population is a perfect way to understand the sub-clinical levels before they manifest as physical symptoms in the birds. Using the digital microscope at the Zoo’s lab to look for parasites in poo. Photo by Kayleigh Meek. 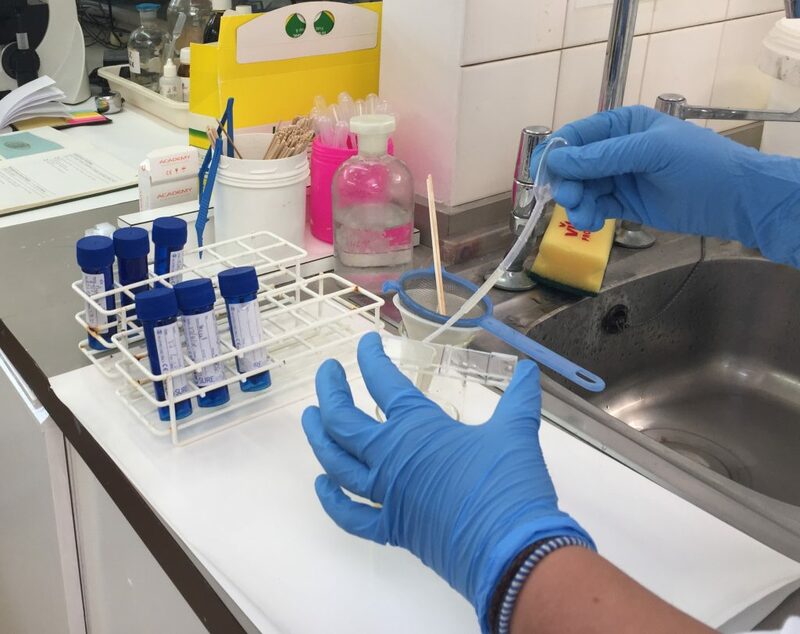 I take a daily sample of faeces (poo to the unintiated) from the birds after they have eaten at the aviary (if you see me running around Sorel with a blue pot, no I haven’t lost my marbles…) and analyse them in the Zoo laboratory. 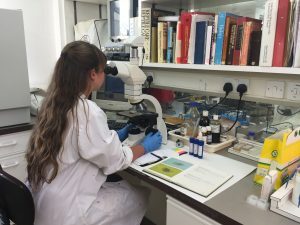 I use what’s called a McMaster slide to count the parasite eggs under the microscope after I’ve mixed the poo with a saturated sugar solution and filtered it. A x50 view of a syngamus ova (the circles are air bubbles). Photo by Elin Cunningham. I’m doing the same thing to the choughs in the zoo, as without eating loads of insects contaminated from the wild they shouldn’t have any parasites. Hopefully this will give a good idea of when the problem times are for certain parasites, and when the choughs should be watched for clinical signs. This can be mapped against other data such as temperature and rainfall to hopefully find triggers for the emergence of parasites. Preparing the McMaster slides. Photo by Kayleigh Meek. I finish the research in July and will have until May 2019 to write and submit it. Gulp. I’ll be sure to post an update on my findings. 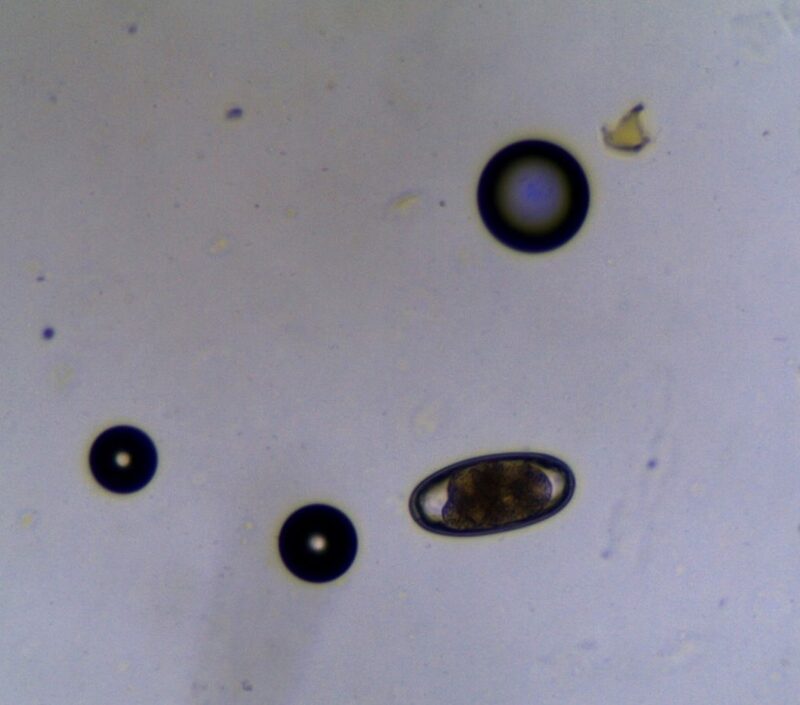 So far, I have found Coccidia and cestodes (tapeworms) in the samples as well as a tiny number of Syngamus. The levels of these parasites aren’t of any clinical significance to warrant treatment. A x50 view of a cestode ova (the bits in the background are urates). Photo by Elin Cunningham. There is a worldwide problem with antimicrobial and anthelmintic (wormer) resistance. Blanket treating every chough on the basis of a parasite present in a faecal sample is only going to encourage that resistance. Combining laboratory analysis with observations of physical symptoms improves efficiency and reduces the potential for resistance. I did a bunch of research on this last year in university for those who are interested in worming and resistance. Sheep and choughs at Sorel sharing parasites. Photo by Liz Corry. You can find me making friends with the sheep at Sorel most afternoons. I have found loads of ruminant parasite eggs, proving that as the birds pick through the faeces of other animals for bugs, they can pick up parasite eggs. These are all specific to ruminants and won’t affect the birds at all so they just pass straight through. 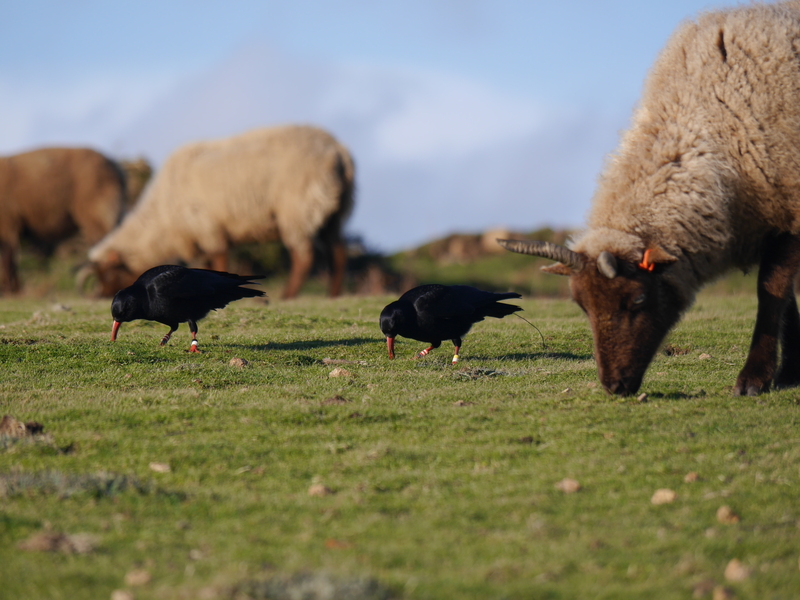 It’s a good relationship: the choughs pick through the sheep droppings for tasty invertebrates, and pinch bits of wool to line their nests with. I’m not sure the sheep see the benefit but I made friends with one who wanted ear scratches a lot, so there’s one positive. Sometimes the excitement in the lab gets too much when I find a whole female parasite containing eggs (I’m constantly kept in check by the lab manager Ann and the other students who don’t find 8mm long sheep parasites nearly as exciting as I do). 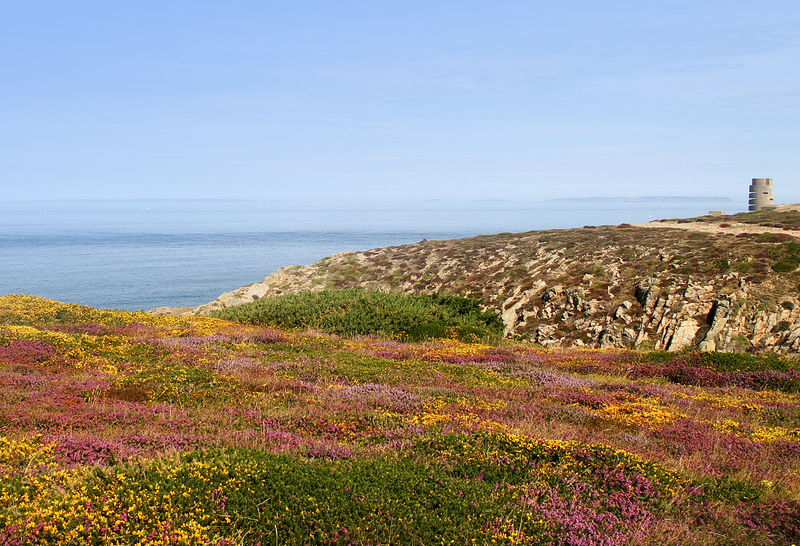 Farmers treating stock with high doses of anthelmintics have contributed inadvertently to a decrease in chough numbers across the UK, as the levels of insects and larvae for the choughs to feed on decreases with anthelmintic use. Luckily the farmers in chough areas are more aware of this now. Finally, with all the faecal data collected, I’m also hoping to map any trends in excretion patterns, such as time of year, weather, and important times such as egg laying and fledging. This may highlight times of the year the birds are more susceptible and warrant change in management practices. I will write again at the end of my placement to let you know the results. If the research is good enough and I ask really nicely it may be published for the world to read, but I’ll give a copy to whoever wants it regardless! 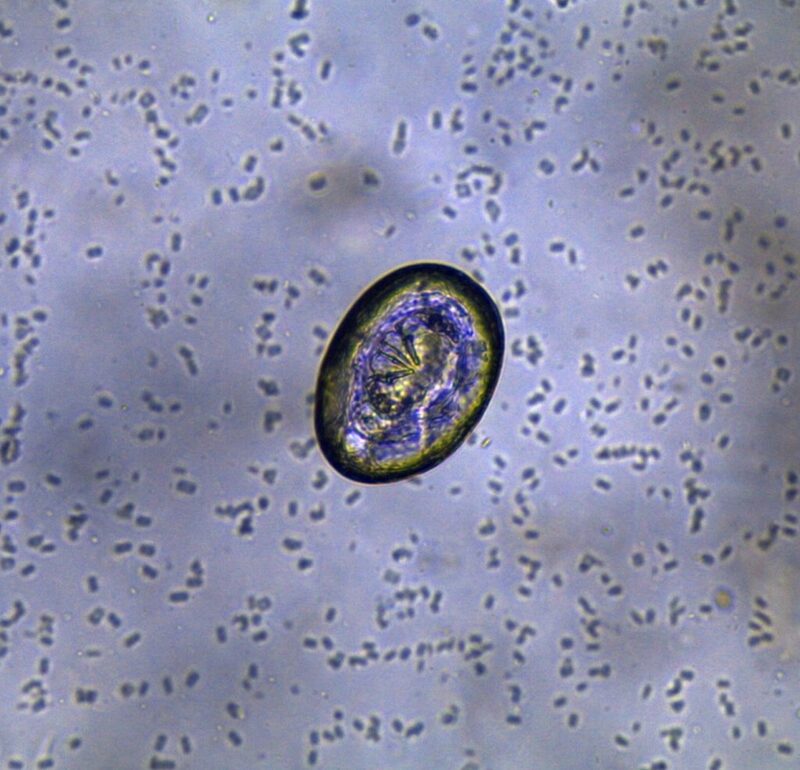 A nematode found in chough faeces from Birds On The Edge on Vimeo. This entry was posted in Bird monitoring, Blog, Choughs by Glyn Young. Bookmark the permalink. Great article Elin. Very interesting. I look forward to reading your update report in due course. Good luck with the degree!